Image courtesy of Library of Congress Arthur Mitchell was the first African-American Democrat to serve in Congress. 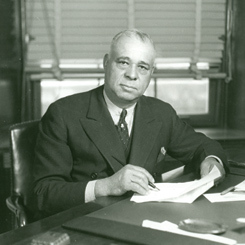 Elected in 1934, Mitchell’s success reflected a trend towards voting for the Democratic Party among northern blacks. Review a brief synopsis of Black Americans who have served in Congress. Joseph Rainey, William Dawson, and Gus Hawkins are a few of the African-American Members who made history in the House.